Been using SVN branches with Tortoise 1.6. I've been periodically merging the trunk into the branch to keep it up to date. Revision 5019 is the head revision. Revision 4737 was the revision when I created a branch. To me, that error message says that the branch was not originally from trunk, which isn't true. Once I did this, I was able to return to the working copy of trunk and reintegrate the branch without any problems. The solution for me was to remove any svn:mergeinfo properties that somehow get attached to individual files in the hierarchy. svn propget -R svn:mergeinfo . After I completed this, my merge executed fine. Click on the error text and press CTRL + A, CTRL + C to copy all the text. The script extracts the relative paths of files with problem mergeinfo and outputs a list of commands to fix each one. You may have to change the 'userdata' value to suit your repository structure. Execute the script to output the commands you need to remove the problem mergeinfos. At the command prompt you can navigate to the branch base (myproject) and execute the commands to delete the problem mergeinfos. property 'svn:mergeinfo' deleted from 'userdata\usermanagementservice'. property 'svn:mergeinfo' deleted from 'userdata\auto_create_db.sql'. property 'svn:mergeinfo' deleted from 'userdata\create_audit_tables_triggers_uds.sql'. As in Gray's answer, now you should commit the changes to the branch and try to reintegrate again. This time it should work! Actually I fixed it using the "merge two different branches" option to merge the trunk and the branch into my working copy. Then I committed that to the trunk. 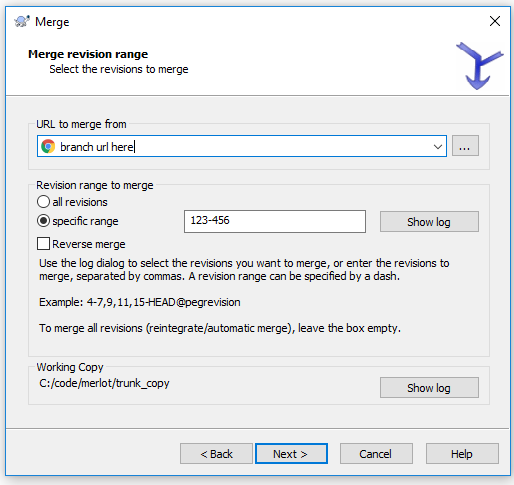 Something that worked for me in tortoise SVN: instead of merging all revisions from branch, choose specific range and manually select all your revisions from the branch. Just do as SVN is telling you. See also my answer here for my experience with a similar case. I'm not sure if this is the source of your problem, but it does look like Subversion 1.8 has problems with the mergeinfo when two changes cancel each other. I ran into this issue. I did an SVN log on my branch to find were I had merged trunk to my branch. I noted all the revisions. I then did the merge of my branch to trunk by specifying the revisions manually. I specified all ranges to exclude the revisions were I merged trunk. I manage to get my branch merged. I had to do some reverts on mergeinfo, but I got my code merged. I immediately deleted my branch. Reintegrate can only be used if revisions […] were previously merged from svn://… to the reintegrate source : which source? What am I doing wrong with SVN merging? Why does merging a range of revisions differ from merging them individually? How can a subversion revision in a branch be blocked from being reintegrated into the trunk?